Step 5 – How to convert Conflict resolution into Best Practice S&T node that can be added to S&T? 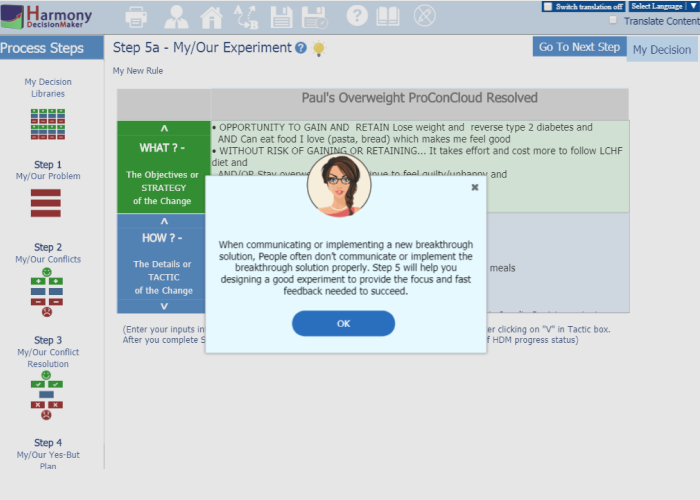 Step 5 is the final step where HARMONY DECISION MAKER automatically summarizes your full analysis into a “Design Experiment” format that clearly answers the WHAT FOR, HOW TO and WHY’s related to your new Decision Resolution. Harmony will show you the hint at the start of this step. WHY#1 is a summary of Step 1 to answer why a change is needed. WHAT FOR is a summary of the PROS you want to gain and retain and CONS you don’t want to gain and retain to answer what the objective is of the new change. WHY#2 is a summary of assumptions challenged in Step 3 and YES, BUTS that needed to be overcome in Step 4. HOW TO is a summary of the full Tactic from Step 3 and 4. You can edit any box by clicking on it. 1. Harmony will show you the hint at the start of this step. 2. WHY#1 is a summary of Step 1 to answer why a change is needed. WHAT FOR is a summary of the PROS you want to gain and retain and CONS you don’t want to gain and retain to answer what the objective is of the new change WHY#2 is a summary of assumptions challenged in Step 3 and YES, BUTS that needed to be overcome in Step 4. HOW TO is a summary of the full Tactic from Step 3 and 4. 3. You can edit any box by clicking on it. 1How can Harmony be of value to me and/or my organization? 2How to subscribe and use different versions of Harmony Web Apps? 3What functionality do different versions of Harmony offer? 4How to print from Harmony Web App? 1.1How to design your own Strategy and Tactic Trees? 1.2How to create your own S&T from the S&T Libraries of generic S&Ts? 1.3How to add details on the What, How and Why of each proposed change? 1.4How to hyperlink documents and media to specific change details to help explain these? 2.1How to share S&Ts with other users such as key stakeholders whose contribution or buy-in is needed? 2.2How to communicate S&Ts to stakeholders to help check assumptions? 2.3How to quantify the financial impact of proposed changes in an S&T? 3.1How to define resources to implement the proposed changes on S&T? 3.2How to allocate resources as Strategy Owners, Tactic Managers and Task Participants? 3.3How to add Strategy and Tactic Planning Details? 3.4How to convert a S&T into Project Network and view it as Gantt chart? 4.1How to update Strategy achievement and Tactic implementation status? 4.2How to view/update Strategy achievement & Tactic implementation status in Grid View? 4.3How to optimize the flow of your work and track task progress all in one place using Kanban board? 5.1How to create My Decision? 5.2Step 1 – How to define My/Our Problem? 5.3Step 2 – How to define My/Our Conflict? 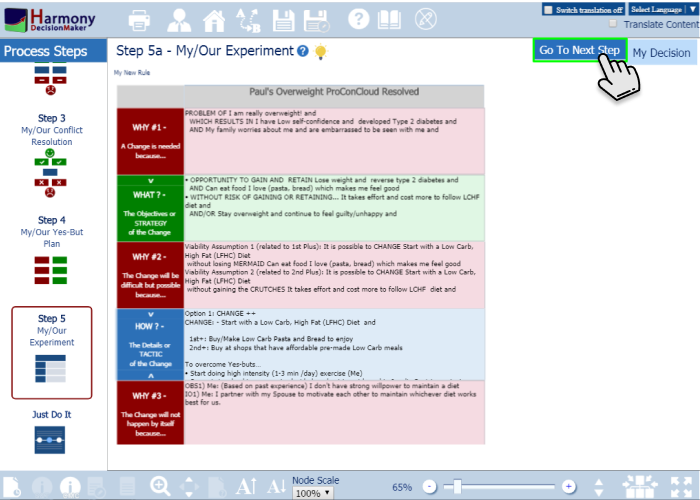 5.4Step 3 – How to resolve My/Our Conflicts with the 4 methods? 5.5Step 4 – How to improve on resolution by listing 3 types of yes, buts and how to overcome these? 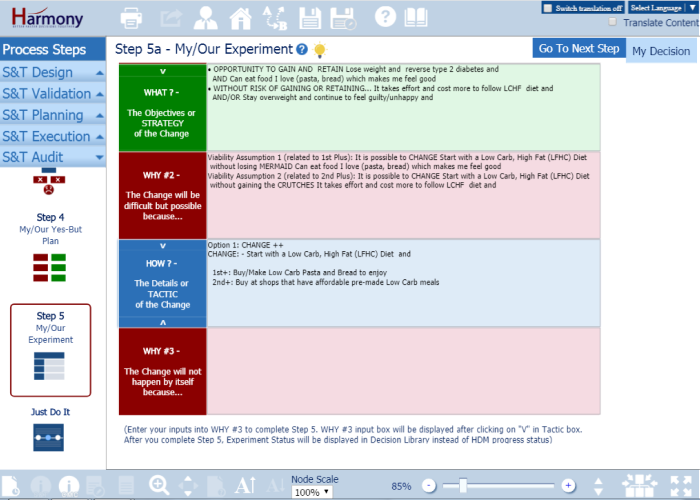 5.6Step 5 – How to convert Conflict resolution into Best Practice S&T node that can be added to S&T?